Many people associate Christmas with beloved songs. Perhaps best-known is Handel's Hallelujah Chorus. Fewer people know that the chorus is a part of a much larger work that explores the life and impact of Jesus through the Scriptures. In Every Valley, readers get a devotion for each day that combines the wisdom of Scripture, the beauty of music, and a new way of thinking about the season of the birth of Christ. Advent tends to be an under-served season in the Christian calendar. Everyone loves Christmas, but fewer people observe the weeks prior as we wait for Christ's arrival. The lyrics of Messiah are taken directly from Scripture, so each day starts with a passage from Handel's masterpiece, then supplies the verses it is based on, and guides the reader to a deeper understanding of the longing that the Jewish people had for the Messiah's coming or the impact of Christ's life. The devotions themselves have been compiled from the Feasting on the Word series and are broken into three sections: Christ's Birth and Foretelling, Christ's Passion and Resurrection, and Christ's Eternal Reign. The words are meant to make you think deeper and reflect about your life and your faith. It avoids the frequent pitfall of devotionals, where everything must end on a chipper note. Instead, the devotions engage the uncertainty of waiting for a messiah and the grief experienced when it seemed that all was lost after the Crucifixion. 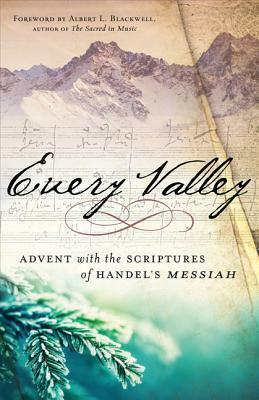 Every Valley is the perfect read both for musicians who have performed selections from the Messiah every year and casual listeners who only recognize the Hallelujah Chorus. The insights shared about the composer and the music itself will deepen the knowledge of Handel aficionados and give newbies insight into why the music and these sacred texts work so well together. I think the best way to enjoy this devotional would be to read it in conjunction with the music. If you are reading Every Valley, listening to each section of music referenced and then reading that selection will give you a renewed and deeper appreciation for both the season of Advent and the gorgeous music of Handel's Messiah. I've never been the type to stick to a devotional, although I do have a couple. I don't know why it's so hard for me. So even though I'll probably never actually utilize this, I love that it becomes more interactive as you add the music for an added layer of worship. I'm not so great about remembering every day myself, hence the reviewing an Advent book in March...I'm using an online one now and I leave the tab open so I see it every time I sit down at my computer. We'll see how it goes! Funny, in my house growing up, we mostly played The Messiah for Easter, not Christmas. We listened to For Unto Us A Child Is Born for Christmas, but not the rest. I have a few friends whom I think would like this book, and I would otherwise probably not have come across it if it weren't for your post, so thank you.